The Herald and Weekly Times Building was constructed in stages between 1921 and 1928 to the designs of notable architects HW & FB Tompkins. The main building dominates the corner of Flinders and Exhibition Streets. The building is a five storey, concrete encased steel frame structure with a commercial, neo-classical facade of giant order Ionic pilasters on both major facades. Notable interior elements [extant at the time of registration but since removed with Heritage Victoria approval] include panelling and vacuum tube in the foyer area, the marble and terrazzo-lined front stairwell, the foyer, doors and panelled offices along the Flinders Street side. Notable external details include the bracketed lights at the base of each pier. The building was the home of the Herald, the Sun News-Pictorial, and the Herald-Sun. Other specialist publications have included the Sporting Globe, Home Beautiful and Who's Who. Victoria's leading country newspaper, the Weekly Times, was also based here. The Herald-Sun is a descendent of Victoria's oldest newspaper, the Port-Phillip Patriot, first published in 1840. In 1930 the steel radio tower was added for the radio station 3DB which broadcast from the building. The Herald and Weekly Times Building is of historical and architectural significance to the State of Victoria. The Herald Building is historically significant for housing the publication of the Herald, the Sun News-Pictorial, and the Herald-Sun, which together have been the most popular Victorian newspapers since the 1920s. The building is also associated with the editorship and chairmanship of Sir Keith Murdoch, the most important newspaper figure in Australia in the inter-war period. The Herald Building is architecturally significant for its monumentality and neo classical styling, which combined with the roof-top neon signs and the twin radio towers, conveys an image of the power and dominance of the print media in the first half of the twentieth century. It is an early example of the commercial neo classical Beaux-Arts influenced idiom in Victoria. 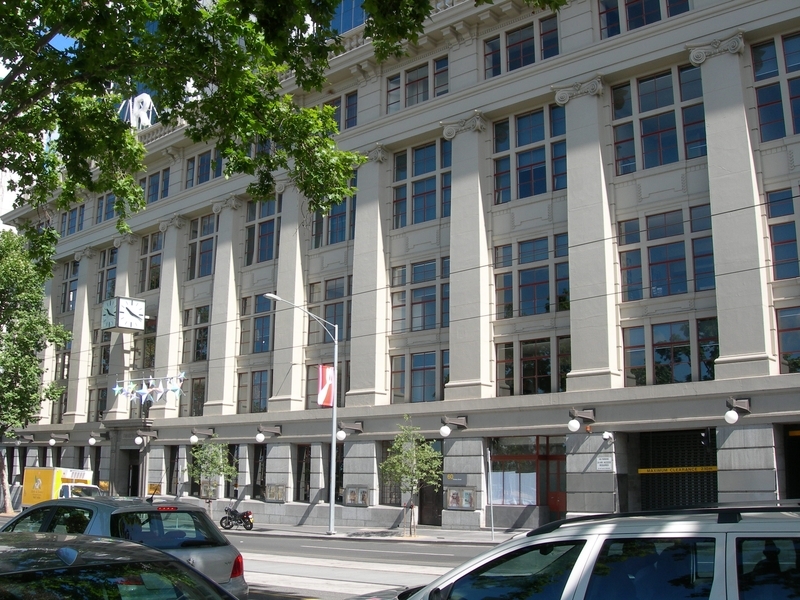 Herald and Weekly Times Building, 44-74 Flinders Street, Melbourne, City of Melbourne. 1. 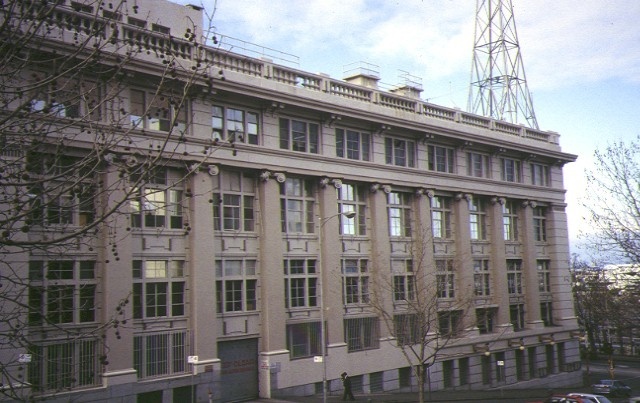 All of the building known as the Herald & Weekly Times Building, including the two radio towers, the illuminated "Herald Sun" sign, the lamps and the poster cases, marked B-1 on Plan 605838 endorsed by the Chairperson Historic Buildings Council and held by the Director, Historic Buildings Council. 2. All of the land marked L-1 on Plan 605838 being part of the land described in Certificate of Title Volume 7547 Folio 183 endorsed by the Chairperson, Historic Buildings Council and held by the Director, Historic Buildings Council. The construction of the Herald and Weekly Times Building commenced in 1921, the same year that a young Keith Murdoch was appointed editor of the flagging Herald. However, the plans for the 1920s expansion seem to have been masterminded by Theodore Fink, chairman since 1902. The Herlad newspaper was descended from the Port Phillip Herald, first published in 1840. From 1849 it became the Melbourne Morning Herald, and from 1855 was simnply known as the the Herald. In 1869, under the brief ownership of David Syme, the Herald was converted to an evening newspaper. Samuel Winter had bought the paper in 1871 and, along qith Theodore Fink, W Baillieu and others, acquired the Weekly Times in 1892. The new building in Flinders Street symbolised the ambitious plans of the Herald and Weekly Times to dominate the newspaper industry. Mr Wise, the General Manager, travelled overseas with the architect H W Tompkins to study the latest developments in newspaper buildings and equipment. The 1920s saw thew company launch many successful ventures in addition to the revival of the Herald. The Sporting Globe begain in 1922, the company purchased the Sun News Pictorial in 1925 and commenced the publication of papers and glossies such as the Listener In and Australian Home Beautiful. Murdoch's career as editor and later chairman of the Herald spanned the years 1921 to 1952. On Fink's death in 1942, Murdoch became chairman, retaining the position until his death in 1952. Through the Herald and other publications Murdoch exerted considerable influence over Australian political and cultural life. The Herald from the 1930s increasingly espoused conservative causes and was particularly antipathetic to the Scullin, Curtin and Chifley governments. The Herald and Weekly Times was acquired by Rupert Murdoch's News Corporation in 1987 and in 1990 the Sun News Pictorial and the Herald were merged to become the Herald Sun. 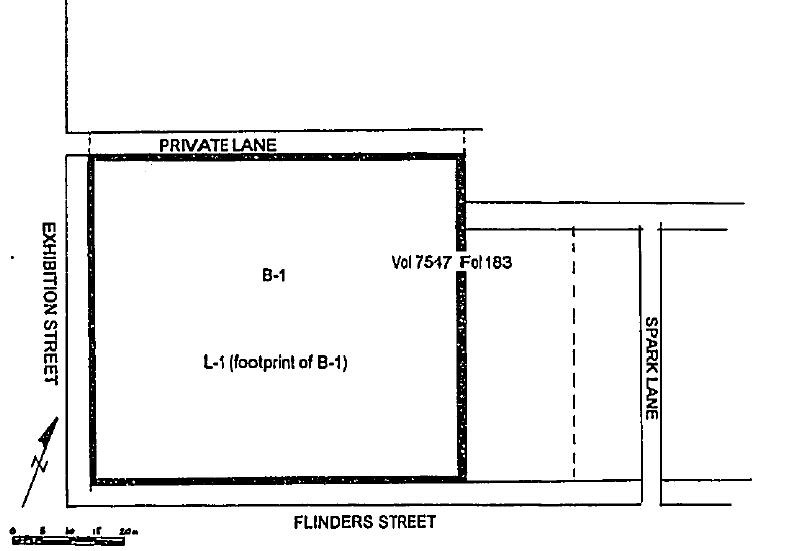 The last papers to roll off the presses in the Flinders Street building were in February 1993, at which time production was moved to Port Melbourne and Southgate. Body Corporate Rules were adopted on 16 March 2006 which require all future works to the Heritage Infrastructure at the site be undertaken in accordance with the Heritage Act 1995 and in particular with the Heritage Audit Management Plan required to be implemented by the Body Corporate Rules. All works undertaken to the Heritage Infrastructure in accordance with the Heritage Audit Management Plan are permit exempt works pursuant to Section 66 of the Heritage Act 1995. The Management Plan defines the Heritage Infrastructure and the ongoing obligations required to manage and maintain the Heritage Infrastructure. It is a requirement of the Body Corporate Rules that a copy of the Heritage Audit Management Plan be supplied to all Body Corporate Members at the site. An original copy of both the Body Corporate Rules and the Heritage Audit Management Plan are held by the Executive Director, Heritage Victoria. Electronic copies of both documents are recorded in the Heritage Victoria data base (HERMES). Any works to any Non-Heritage Infrastructure at the Former Herald and Weekly Times Building that is will not result in a negative visual impact or structural damage to the Heritage Infrastructure are permit exempt works, pursuant to Section 66 of the Heritage Act 1995. This includes an exemption for all non-structural internal works to any part of the Former Herald and Weekly Times Building built after the date the site was placed on the Victorian Heritage Register, on 23 May 1996.
ii. sub-surface works that may cause structural damage to Heritage Infrastructure, such as the perimeter walls. iii. the application of colours to structures (such as walls, gutters, roofs, window sills) that are unsympathetic to associated Heritage Infrastructure. Where doubt exists whether proposed works may result in a negative visual impact or structural damage to the Heritage Infrastructure, clarification from the Executive Director as to whether a permit is required must be obtained prior to the works being commenced.